I wrote my first book at the age of 9 years old on a Basildon Bond notepad. Titled 'Mr Plum And Mr Apple', the hand­ written story received the inevitable rejection slip, but that didn't stop me dabbling with writing throughout my life. 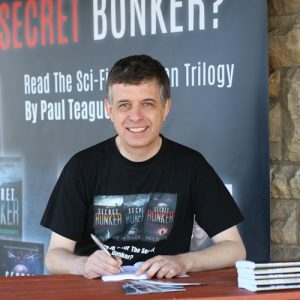 The Secret Bunker Trilogy was inspired by a family visit to a remarkable, real-life secret bunker at Troywood, Fife. My next dystopian project was 'The Grid' which was based around an initial idea that appeared in The Secret Bunker. I've just moved into writing thrillers, fuelled by my childhood love of The Famous Five, Agatha Christie and James Hadley Chase. These days I read Harlan Coben, Linwood Barclay and Mark Edwards and this is the tone I'm aiming for in my own books. You can listen to my author interview with Tim Lewis, the host of the Begin Self-Publishing Podcast here. Thanks for visiting this site, and please feel free to get in touch if you have any questions.